The hours between 3 and 6 pm are a time of opportunity for students. But if they’re not involved in structured, supervised learning, there’s plenty of opportunity for high-risk behavior. 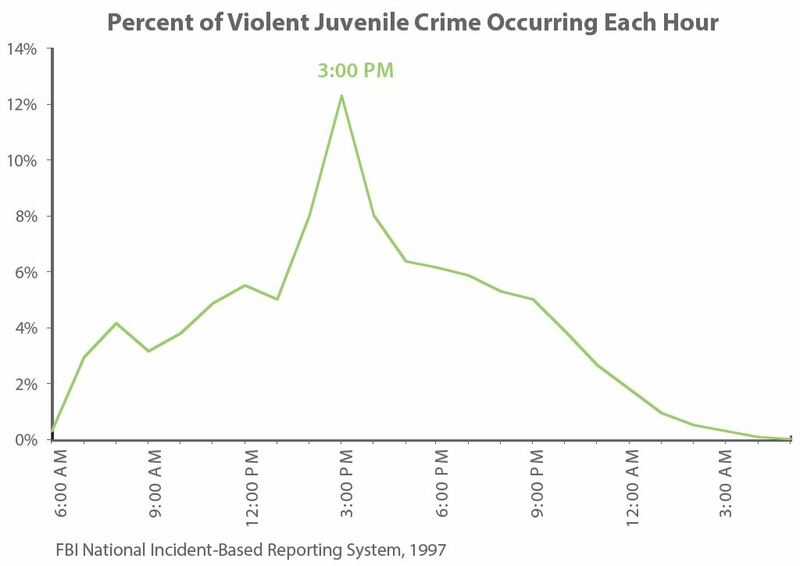 Nationally, juvenile violent crimes triple during the 3-6 pm window. During these hours, youth are also most likely to be victims of a crime, get in a car accident, smoke, drink and do drugs. Teens who don’t participate in afterschool programs are 3 times more likely to use marijuana or other drugs and are more likely to drink, smoke and engage in sexual activity (YMCA of the USA, 2001). The summer months represent the same dangers for disengaged students. That’s when first use of alcohol, tobacco and drugs peaks among youth ages 12-17 (SAMHSA, 2012). And none of this is surprising, considering that more than 25% of students spend those hours unsupervised—and that percentage goes up in high-poverty communities. These national numbers are stunning, but in Nebraska, the challenge is even greater. 36% of our state’s students are unsupervised afterschool, compared with the national average of 26%. It’s a fact. Kids in high-quality ELOs are safer. Aside from the countless academic advantages, access to high-quality afterschool and summer learning programs–experiences we call Expanded Learning Opportunities (ELOs)–ensures that students are in a safe, structured and supervised environment in the off-school hours. They’re receiving healthy snacks, getting homework help, and engaging in the kind of hands-on learning many children would not otherwise get to experience. high risk behavior. The risks associated with the hours between 3-6 pm and the summer months have been effectively removed by ELOs. That’s a lot of good generated in the afterschool hours and summer months.